On Friday (September 30), at the funeral of Shimon Peres, the former Israeli leader who won international acclaim for peacemaking with the Palestinians and one of the country’s founding fathers, Palestinian President Mahmoud Abbas and Israeli Prime Minister Benjamin Netanyahu shook hands and exchanged brief words. 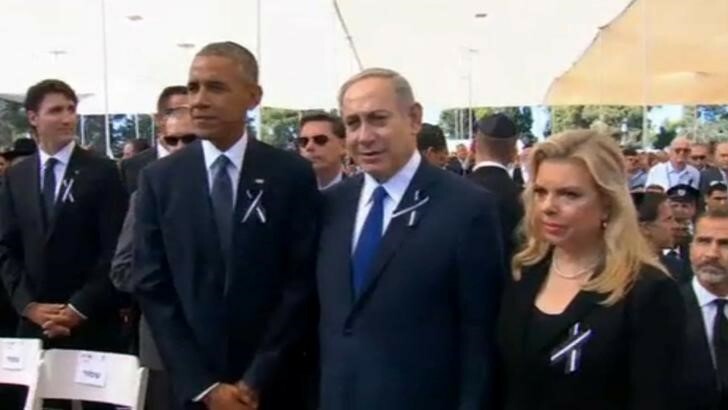 U.S. President Barack Obama and other world leaders gathered for the burial in Jerusalem’s Mount Herzl cemetery, two days after Peres, a former president and premier, died at the age of 93. “Long time, long time,” Abbas told Netanyahu and the prime minister’s wife Sara, after shaking his hand before the start of the state ceremony. But Abbas’s rare visit to the city, a short drive through Israeli military checkpoints from Ramallah, in the occupied West Bank, seemed unlikely to yield anything more than handshakes. Israeli-Palestinian negotiations have been frozen since 2014 and Netanyahu and Abbas, deeply divided over Jewish settlement on land Palestinians seek for a state and other issues, have not held face-to-face talks since 2010. Abbas was given a front-row seat between European Council President Donald Tusk and Hungarian Prime Minister Viktor Orban. Obama briefly greeted the Palestinian leader with a kiss on each cheek before walking down the line to stand next to Netanyahu. Peres, who died two weeks after a stroke, jointly won a Nobel Prize for his peace efforts with the Palestinians in the 1990s, landmark talks that have failed to achieve a final land-for-peace agreement. Obama and Netanyahu were to deliver eulogies at the cemetery, which overlooks the Jerusalem forest and a verdant valley, in what could be an opportunity for the president to encourage Israelis and Palestinians to revive peacemaking. U.S. officials have held open the possibility of Obama making another formal effort to get peace negotiations back on the agenda before he leaves office in January, possibly via a U.N. Security Council resolution. With time short between the end of the funeral and the start of the Jewish sabbath at sundown, no plans were announced for any diplomacy on Friday. Obama and Netanyahu, who have had a testy relationship, last held talks on Sept. 21 in New York, on the sidelines of the U.N. General Assembly.